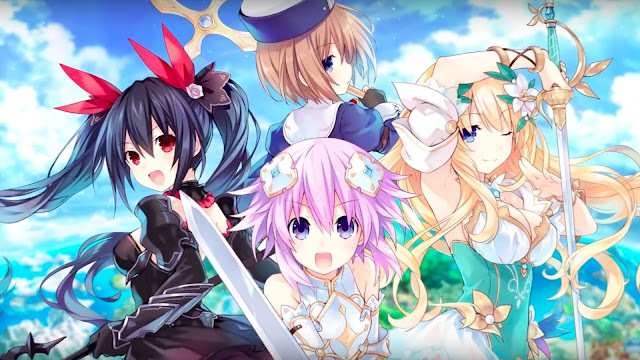 Michael reviews the latest installment in the franchise Cyberdimension Neptunia – 4 Goddesses Online. A world known as Gamindustri (ゲイムギョウ界 Geimugyō-kai, a pun on ゲーム業界 Gēmu gyōkai, “game industry”) protected by the divine aegis of the four CPUs (Console Patron Units, the goddesses) and their sisters, the CPU candidates. Most of the game takes place inside “4 Goddesses Online” a recurring fictional MMORPG that has been referenced throughout the series. The setting of the MMORPG is in the fantasy land of Alsgard, a vast world surrounded by verdant and gorgeous ocean. The four CPUs were able to receive an early access code for the newest installment of the popular online game, “4 Goddess Online”, which uses the real forms of the CPUs as official models. Each CPU logins in to the gain with their own motives for playing the game. Upon entering the game, they were approached by the guardian spirit, Bouquet, who is one of the game’s NPCs that is equipped with the game’s advanced artificial intelligence. They were told that they are the Chosen Ones that are tasked to save Alsgard from the Demon King Jester by awakening the four divine Goddesses of legend. While Cyberdimension Neptunia: 4 Goddesses Online makes strides in the technical and gameplay department, certain aspects of presentation take steps backwards. Still, this game has solid gameplay, lots of replay value and content, fun (yet polarizing) characters and amazing music. If you’re in the market for another Action JRPG for the Playstation 4, this would be a good choice.